Fresh from the adventures of the throw pillow I had just finished, I plunged into the creation of another throw pillow ... just to get over the errors I made with the other one. Kinda like getting back on the horse that threw you. This new pillow had it's own "adventure". 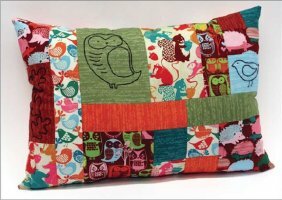 I didn't make the same mistakes as on the previous pillow (thankfully!) but I did manage to make a new one. Fortunately, it was easily remedied (and more notes were made on the directions). 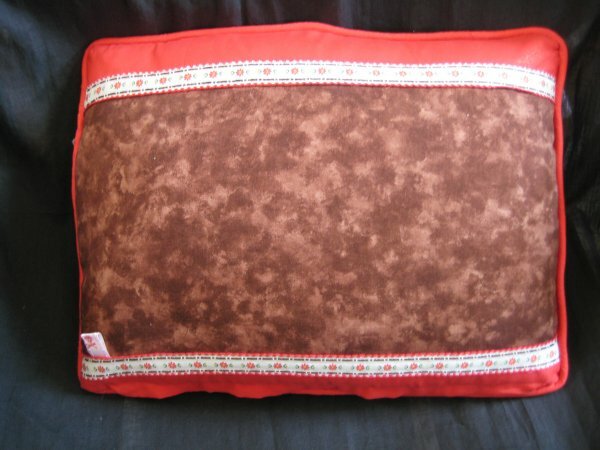 The Hoffman pattern creates a pillow 14" x 20", which is a nice size for an accent pillow. *I* already had an accent pillow insert but its dimensions were 12" x 16". I wasn't particularly worried; I found that if I reduced the size of the patches by 85%, I could use my smaller pillow insert but retain the proportions of the original layout. Let me say that I am a good technician. But I'm a lousy original designer! I don't think I would have ever come up with the patchwork layout that Hoffman did, so I am very grateful when some talented designer does it for me! I didn't have a fabric in a suitable size for the backing, but following the patchwork nature of the front, I chose to piece the backing as well. I covered the seamlines with a decorative ready-made trim. Additionally, I threaded brown floss through the beading of the trim for additional interest. And that tag? Well, that's my own machine-embroidered "pirate" tag. :-) It's a teeny-tiny skull-and-crossbones that fits so perfectly on narrow ribbons and adds a unique touch to my projects. 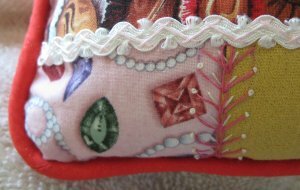 BUT, I thought that if I had some seam embellishments using some crazy quilt embroidery stitches, that might make the pillow more interesting to look at. Remember my comment about not being terribly original? Well, I've stuck myself in the same position with respect to the crazy quilt embroidery! There are actually a surprisingly few number of actual embroidery stitches. BUT, like music notes, they can be combined in innumerable ways! In any way you choose! In any color combination! aaaiieeee!!! How on earth do I decide WHAT stitches to use??? Well, I don't. :-) At this stage of my unoriginality, I rely heavily .. I mean HEAVILY .. on pictures of what others have done and on instructional books with lots of pictures. :-) It just amazes me how those clever people come up with those particular stitch combinations. It's just beyond me. I might add, at this point, that I was hit by a Light Bulb Moment ... I had acquired quite a collection of ribbons and trims from my dear mother-in-law when she passed on. I carefully washed, pressed and put away these ribbons and trims, waiting for the appropriate time to use them. Well, by golly, THIS was the time! Youngest Dear Daughter loved her Grandma so very much; I think having those ribbons and trims on this pillow will make it extra special for her (at least I hope so). And so, armed with inspirational pictures and books, here are some of the details of the stitches I chose to use to embellish the seams of this pillow. The white ribbon is a sort of an embellished rick-rack. In every valley, there is a small "puff" of thread; it comes that way. I attached this embellished rick-rack with a herringbone stitch. The vertical seam is a series of lazy daisy stitches with some straight stitches diagonally off to the sides. The longer diagonal stitches have a French knot at the ends. 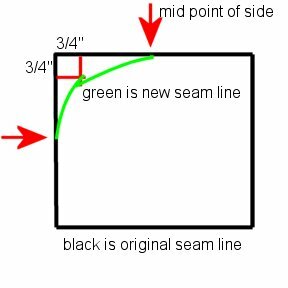 right seam: a foundation is a zig-zag. Lazy Daisies with straight stitches are at each apex. French knots are in the spaces in between. 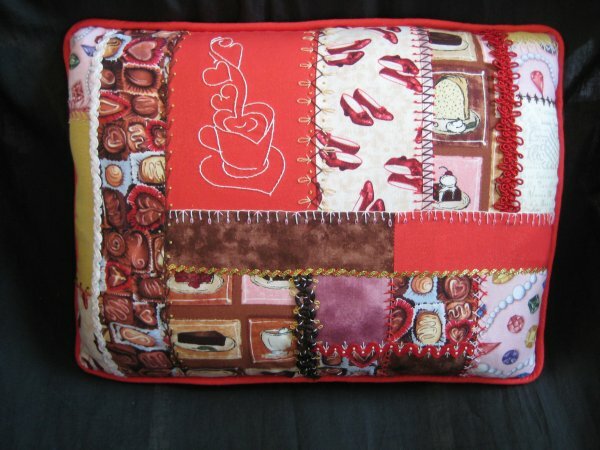 The coffee mug is stitched with a whipped back-stitch. Which, by the way, is the ONLY way that *I* have ever, ever, ever been able to achieve a smoothly curving line for outlining. I have never, ever, ever been able to successfully master the stem/outline stitch. This is my "cheat" and I just love it! 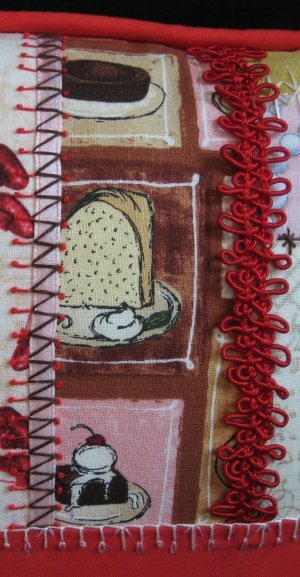 The horizontal seam at the bottom is a basic blanket/buttonhole stitch with Lazy Daisy, straight stitch and French knot additions. 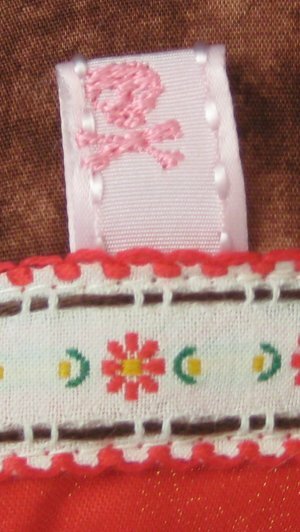 left seam: a pale pink ribbon is kept in place by a foundation of vertical and diagonal straight stitches. 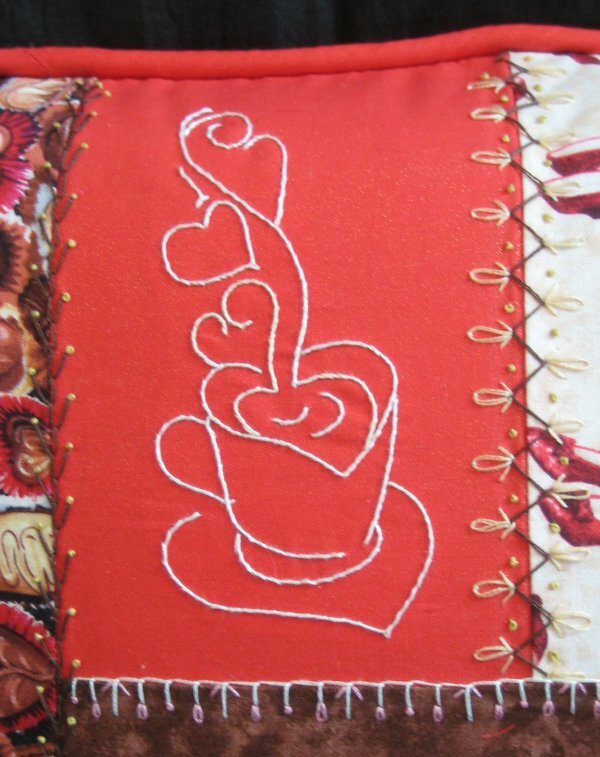 Further embellishments are more French knots. right seam: a ready-made trim that was simply couched in place with a matching color thread. This one is so neat! The narrow, gold, metallic rick-rack is held in place with diagonal stitches. It looks like a candy cane to me. This is some weirdly curled ready-made trim. I had no idea what to do with it, so I couched it with a contrasting thread. I had vague ideas that the little contrasting stitches would look "interesting". After completing them, they didn't look so terrific. But, I didn't want to take them out and re-do them. So, I added some Lazy Daisy stitches. It still doesn't look so terrific. I probably should have just couched it with brown thread and left it at that. Oh, but the red rick-rack came out so wonderful!! The red rick-rack is actually held down by all the French knots. 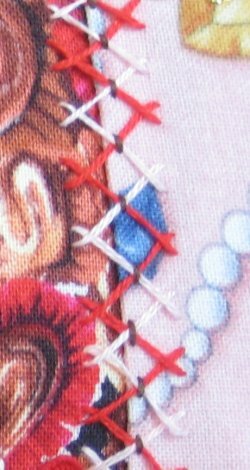 This seam is decorated by two layers of herringbone stitches and tacked down with a small straight stitch at the main intersection. I want to end this page with a small rant: for the most part, whenever I see throw pillows, they almost ALWAYS have dog ear corners! That simply drives me NUTS! There is just no reason, whatsoever, to have a sway-backed pillow with pointy little dog ear corners! Those dog ears are created because the pattern has right angle corners. The pillow insert (or stuffing) will not fill out those corners correctly. The solution is very, very simple! What you now have is a curving corner. It looks wrong, doesn't it? But it WORKS. When you put the pillow insert into the pillow cover (or stuff it with filling), the resultant corners will *BE* a nice right angle corner ... *no sway back edges or pointy dog ear corners*!